Daniel turned 11. His Mum told me that he's really into riding his bicycle at the moment and sent me a photograph of the bike so that I could copy it. She also mentioned that he often wears a particular jacket when he's out on his bicycle, so I copied that too. I added his helmet, the badge of his favourite football team, Manchester City, and a big red number 11 to mark his age. Mum was delighted and messaged me to say that the card was "another success". 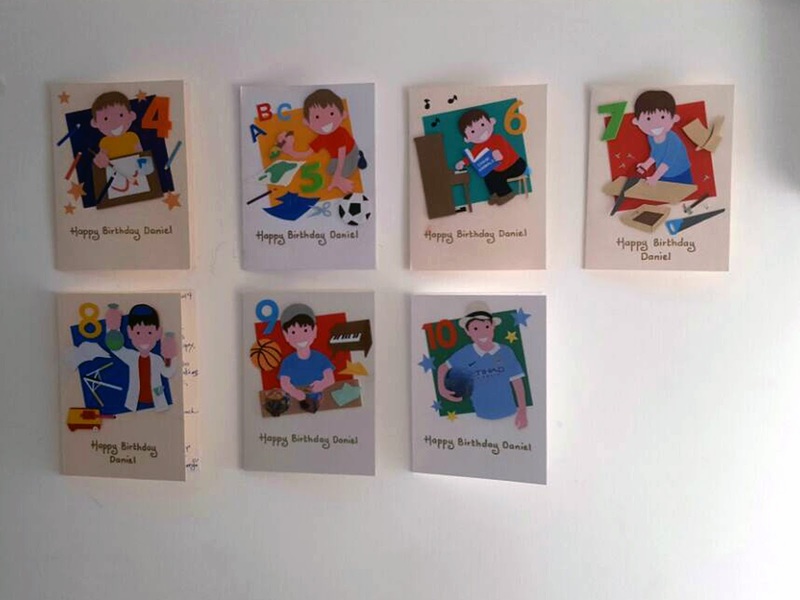 Daniel, and his brothers, receive birthday cards made by me every year. Their Mum says that it has become part of the family's birthday celebrations. Some months ago she sent me this wonderful photo to show me how Daniel was decorating his bedroom. He had lined up all the cards I have made for him over the years, and they were on the wall next to his Manchester City poster. A great honour indeed! Mum also celebrated her birthday some time ago. Even though she orders the cards for her sons', I always do my best to remember her big day too. This year I decided to make her a papercut card, cutting out her name by hand from white stock then lining the card with a bright pink paper inlay. She was very happy to receive it. * This post has been shared on Saturday Shuffle at Strawberry Butterscotch, Saturday Sparks @Pieced Pastimes, Seasons, Happiness is Homemade, Sweet Inspiration, Sundays at Home, Make it Pretty Monday at The Dedicated House, Wordless Wednesday (on Tuesday), The Good. The Random. The Fun. and Monday Morning Blog Club. I love the way you individualize each card. Wonderful cards, all of them! Daniel is a lucky boy: In your cards he has a lovely series of memories. Well done as always! I love all the details with the bike rider. :) Very cute. Love these ... lots of thought into each one. Happy Monday! Your story about Daniel and his brothers, who have your cards line up in their room, made me realize how much kids appreciate your work, they see it as a present, and how it gives them a boost in their self-esteem! Thank you for bringing them to ALL SEASONS, and have a Spring-y week! I love your bicyclist card. Any bicyclist, of any age, would love it. How sweet, Lisa. He is so cute on his bike. Boys and their football! So adorable! I need to hire you to make my greeting cards. What a fabulous family tradition! What beautiful cards, you are very talented.